They imply negative action - 'without doing it' or 'instead of doing it', means you don't actually do it. They can start the clause, or link two clauses. You still drop the subject and the verb in the second sentence and replace them with the infinitive. You may need to omit the negative word. Ich war oft in Bremen. Ich habe das Universum nicht besucht I have often been in Bremen. I have not visited the Universum. Sie sind in die U-Bahn gesprungen. Sie haben keine Fahrkarten gekauft. They jumped into the underground. They did not buy tickets. Ich spiele oft am Computer. Ich mache die Hausuaufgaben nicht. I often play on the computer. I don't do my homework. Ich war oft in Bremen, ohne das Universum zu besuchen. I have often been in Bremen without visiting the Universum. Sie sind in die U-Bahn gesprungen, ohne Fahrkarten zu kaufen. They jumped into the underground without buying tickets. Ich spiele oft am Computer, anstatt die Hausaufgaben zu machen. I often play on the computer instead of doing my homework. Er fährt gern Kanu, anstatt zu segeln. He likes canoeing instead of sailing. Bremen has been an important port and commercial and industrial city for hundreds of years. Its interactive science museum, das Universum, welcomes thousands of visitors each year. Visitors can explore three main themes at the museum, namely technology, humans and nature - Technik, Mensch und Natur. 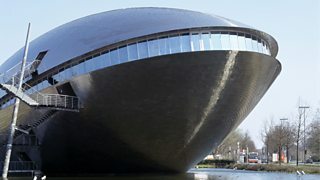 The museum is housed in a very distinctive-looking, metal building that looks like a cross between a mussel and a whale.